Ever experience slight red patches or areas of dryness? Maybe even itchy skin, a tingle, tightness or a stinging sensation? You’re not alone. These are all signs of sensitive skin, which up to 16 million Americans experience. Typically, sensitive skin can be tight, dry, flaky, irritated, and can flush easily. Extremely dry skin that goes uncared for can become sensitive skin, so be sure to keep skin hydrated. 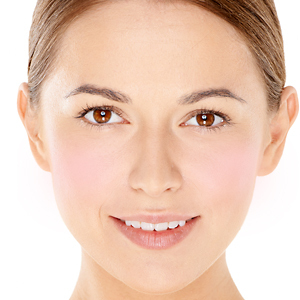 Rosacea is a sensitive skin condition that causes flushing, redness and often small, red, pus-filled bumps. It’s a chronic condition that can be potentially life disrupting for some. It is important for treatments to be gentle, yet effective, for those of us with sensitive skin conditions, including Rosacea. If you’re experiencing red bumpy skin on the back of your arm or thigh, it’s probably keratosis pilaris. It’s similar to blemishes, but treated more like a sensitive skin condition. When treated properly, skin will have a more even tone and even texture. DermaSweep’s gentle bristle tip exfoliation and oxygen driven circulation is the perfect combination for all sensitive skin types. Adding a specific SkinFusion formulated specifically to calm redness, reduce inflammation and improving cellular turnover is an added bonus. The outcome is a relieved, restored, more beautiful you! If you believe you have Rosacea, we recommend seeing your trained medical skin care professional for a customized DermaSweep treatment plan.